Deadpool raked in over $132 million last weekend. That’s a bigger weekend opening than Superman: Man of Steel, Spider-Man, or Iron Man, which means it is one of the most successful opening weekends for any comic book movie ever. This shouldn’t come as a surprise, because Deadpool has been one of the world’s most popular comic book characters for the past thirty years. That’s why we’re making it easy to catch up on the best titles from everyone’s favorite regenerate degenerate. Don’t know where to start? You can’t go wrong with these 5 Deadpool must-reads. This collection of comics includes Deadpool’s first appearance in New Mutants #98. Artist Rob Liefeld and writer Fabian Nicieza introduced the character to the series as an homage to Deathstroke, one of Liefeld’s favorite characters from Teen Titans. Deadpool was so popular that he later starred in his own limited-run series in 1993, 1994, and 1997 (each included in this collection). This is the perfect place to start if you’re interested in meeting the Merc with the Mouth. Though it only ran for 50 issues, Cable & Deadpool earned a devoted fan base by delivering a mix of humor, action, and intricate plotting. Rumor has it that the theatrical sequel to Deadpool will introduce a cinematic version of Cable, with the script drawing inspiration from Cable & Deadpool. If you loved the movie and can’t wait to see Deadpool’s return to the silver screen, then this comic is for you. If you watched the regrettable X-Men Origins: Wolverine then you were likely introduced to a less-than-accurate version of Deadpool (also played by Ryan Reynolds). We promise that the limited run Wolverine Origins: Deadpool features characters that are both accurate and in continuity. This series follows an early battle between the two titular characters, in which Deadpool is hired to kill Wolverine. This blockbuster series is required reading for any comic book fan. This out-of-continuity miniseries reimagines Deadpool as an ex-WWII prisoner of war who was tortured into insanity and then enlisted as one of the CIA’s most effective agents. 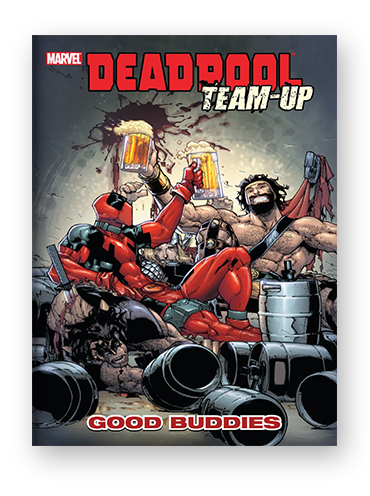 It’s a strange and enjoyable read, with era-specific interpretations of Deadpool’s finer quips, including dual narratives, gallows humor, and infamous fourth wall breaks. This limited run features issue-by-issue team-ups with some of Marvel’s most popular fringe characters, including The incredible Hercules, the Zapata Brothers, and yes, even the cult-classic Frankencastle. These team-ups are unlikely to ever be adapted to film, which makes this collection a fun read for any serious comics fan.